NOTE: This step will restore the hiberfil.sys file, and the Allow hybrid sleep and Hibernate after Power Options under Sleep. C) If you would also like to have hibernate turned on, then you will also need do to step 2 in OPTION FOUR below. D) If you like, you may also wish to add or remove Hibernate from power menus. E) Go to step 5 below. NOTE: This step will disable hibernation, delete the hiberfil.sys file, and remove the Allow hybrid sleep and Hibernate after Power Options under Sleep. 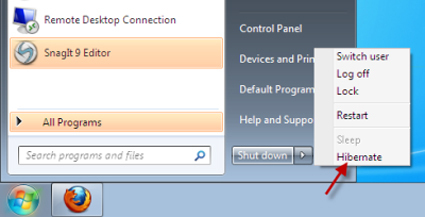 This will also disable fast startup in Windows 8. 5. You can now close the elevated command prompt if you like. artikel nya keren thanks gan buat artikel nya menambah ilmu.